Joseph A. Sestak, Jr. is a Democratic member of the United States House of Representatives, representing the 7th district of Pennsylvania. During his distinguished 31-year career in the United States Navy, Sestak attained the rank of three-star Admiral and served in the White House, Pentagon, and in operational commands at sea. He served as President Clinton’s Director for Defense Policy on the National Security Council, oversaw the Navy’s warfare budget as Deputy Chief of Naval Operations, and led a series of commands at sea, culminating in command of the USS George Washington Aircraft Carrier Battle Group during combat operations in Afghanistan and Iraq. Sestak received $1000 in lobbying funds from Planned Parenthood in 2008. The Council for a Livable World, founded in 1962 by long-time socialist activist and alleged Soviet agent, Leo Szilard, is a non-profit advocacy organization that seeks to "reduce the danger of nuclear weapons and increase national security", primarily through supporting progressive, congressional candidates who support their policies. 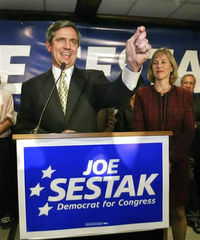 The Council supported Joe Sestak in his successful 2008 House of Representatives run as candidate for Pennsylvania. The Council is also supporting Joe Sestak in his 2010 election campaign. He has also been previously supported by the Council. In the House, he quickly emerged as one of the leading voices calling to bring our troops home from Iraq. While he served in Congress, he earned a progressive voting record on issues like missile defense and Afghanistan. He favors policies that would reduce the threats of nuclear weapons and opposes expensive and ineffective missile defense systems. He supports ratification of the Comprehensive Nuclear Test Ban Treaty and removing nuclear weapons from hair trigger alert. On Jan. 27, 2010, U.S. Representatives Keith Ellison and Jim McDermott led 52 other members of Congress in signing a letter addressed to President Barack Obama, calling for him to use diplomatic pressure to resolve the blockade affecting Gaza. Joe Sestak was one of the signatories of the letter. The entire letter together with a complete list of signatories can be read by clicking here. In 2008 Sestak was endorsed by JStreet PAC. This page was last modified on 17 April 2016, at 20:59.